Donald Crockett has received a commission from New Music USA to compose a major work for the outstanding young cello quintet, SAKURA, for the 2019/20 season. The premiere will be on the Closing Gala concert of the Piatigorsky International Cello Festival in Disney Hall, Los Angeles on March 22, 2020. Stay tuned for additional details! Updates on the project also available at the New Music USA website. Donald Crockett's new music ensemble work, Whistling in the Dark, conducted by the composer, together with Wet Ink for violin and piano and mickey finn for solo violin will be featured in a concert at the Norwegian Academy of Music in Oslo, Norway on March 24. Donald Crockett will be in residence at the Academy March 19 - 24 doing masterclasses, composition lessons and rehearsals leading up to the concert. Chicago's Fifth House Ensemble continues to carry Donald Crockett's piano trio, Night Scenes on tour in 2018/19. This performance on April 7 is at Hey Nonny in Arlington, Illinois. HOCKET (Sarah Gibson and Thomas Kotcheff) and Thornton Edge perform Donald Crockett's new concerto for duo pianists and chamber orchestra, And the River, conducted by the composer, in an Edge concert also featuring Sean Friar's Dynamics for cello solo and chamber winds with soloist Michael Kaufman, and Morten Lauridsen's Lorca Songs. Newman Recital Hall, USC campus, 7:30 pm. Gloria Cheng's Garlands for Steven Stucky tour continues with a performance at the Madrid Theater in Canoga Park, CA, with pieces by 32 friends and colleagues of Steve including Donald Crockett's Nella Luce. Saturday April 13. 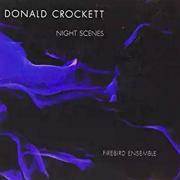 Fifth House Ensemble continues to carry Donald Crockett's Night Scenes for piano trio. This performance will be at Southeast Missouri State University on April 28, 2019. Donald Crockett conducts the Hear/Now Festival ensemble in Karen Tanaka's Water and Stone. May 4 at 8pm, First Lutheran Church of Venice. Gloria Cheng's Garlands for Steven Stucky tour continues with a performance of the 32 works composed in honor of Steve including Donald Crockett's Nella Luce. University of Missouri-Kansas City, Thursday May 9. Fifth House Ensemble continues with Night Scenes for piano trio in a concert for the Waukegan Chamber Music Society in Waukegan, Illinois on May 12, 2019. Donald Crockett conducts Thornton Edge in a program of new mixed ensemble works by the sixteen intrepid young composers of the LA Phil's celebrated Composer Fellowship Program directed by Andrew Norman with assistance from Sarah Gibson and Thomas Kotcheff. Noon to Midnight, REDCAT at Disney Hall, June 1 in the afternoon. Donald Crockett conducts microtonal music for multiple pianists (HOCKET - Sarah Gibson and Thomas Kotcheff - Vicki Ray and Steven Van Hauwaert) by Ivan Wyschnegradsky during the 2019 Other Minds Festival. June 16, Yerba Buena Center for the Arts, San Francisco. Donald Crockett returns for the opening weeks of the Aspen Music Festival to conduct his concerto for duo-pianists and chamber orchestra, And the River, with HOCKET and the Aspen Contemporary Ensemble (ACE). And the River is a co-commission with the Aspen Music Festival and School, Kaleidoscope Chamber Orchestra and the Oberlin Contemporary Ensemble. Donald Crockett also conducts Sebastian Fagerlund's Octet Autumn Equinox, and works with ACE and the Aspen composition fellows in the preparation of their new pieces composed for ACE at the Festival. June 29 - And the River at Harris Hall, 4:30 pm. July 6 - Octet Autumn Equinox at Harris Hall, 4:30 pm. Donald Crockett returns to the Atlantic Music Festival as a resident composer, where he will teach composition students and coach performance fellows in his music. Colby College, Watertown, Maine. July 8 - 14. Donald Crockett returns to the Bennington Chamber Music Conference, in its 74th year, to work with Resident composers Allen Shawn, Scott Wheeler and Judith Shatin, composition fellows, faculty coaches and participants in this amazing chamber music summer camp. He is also one of the commissioned composers for a new chamber work (together with Hannah Lash, Elizabeth Ogonek and Stephen Hartke) for the CMC's 75th Anniversary season in 2020. July 21 - August 4, Bennington College, VT.
Donald Crockett leads Thornton Edge new music ensemble in recent works from the US, including Andy Akiho's Karakurenai, Keith Fitch's Midnight Rounds and Sarah Gibson's Outsider. The intrepid piano duo, HOCKET, returns to USC as Thornton Edge's ensemble-in-residence for Spring 2019; they will appear in Andy Akiho's and Sarah Gibson's pieces on this concert. Newman Recital Hall, USC campus, 7:30 pm. Donald Crockett conducts the USC Thornton Symphony in the annual New Music for Orchestra concert of works by Thornton student composers. New Music for Orchestra, lead by Donald Crockett each year, has presented over 150 new works by USC Thornton student composers; many of these new works have gone on to subscription concerts with orchestras nationally, and garnered numerous awards, readings and commissions for these outstanding young composers. Donald Crockett's piece for harp, flute, clarinet and string quartet, Tracking Inland, will be performed by the Arctic Philharmonic, Timothy Weiss, conductor, in a program with Ravel's Introduction and Allegro for the same instrumentation, and Stravinsky's Three Japanese Lyrics. Narvik, Norway. Gloria Cheng's Garlands for Steven Stucky in Piano Spheres series, including Donald Crockett's Nella Luce. Zipper Hall, Colburn School, Los Angeles, Tuesday November 27. Thornton Edge new music ensemble, conducted by Donald Crockett, will perform a program of American music (Charles Ives, Elizabeth Ogonek, David Dzubay) on this concert at Newman Recital Hall on the USC campus, Tuesday November 13 at 7:30pm. HOCKET (Sarah Gibson and Thomas Kotcheff) and the Oberlin Sinfonietta conducted by Tim Weiss present And the River on the road at the Cleveland Museum of Art, Sunday November 11 at 2pm. Donald Crockett's new concerto for duo-pianists (HOCKET) and chamber orchestra, And the River, continues its premiere run at Oberlin, with the Oberlin Sinfonietta conducted by Tim Weiss, and HOCKET again as the soloists. Oberlin Conservatory, November 9. Gloria Cheng's Garlands for Steven Stucky tour continues, with pieces by 32 friends and colleagues of Steve, including Donald Crockett's Nella Luce. Cornell University, Friday October 12; Northeastern University, Boston, Sunday October 14. Donald Crockett conducts the USC Thornton Edge new music ensemble in a concert featuring music by (mostly) European composers Pierre Boulez, Hans Abrahamsen, Judith Weir, Anton Webern and Toru Takemitsu. Newman Recital Hall, USC campus, Tuesday October 2 at 7:30pm. Gloria Cheng is touring her Garlands for Steven Stucky album in 2018/19, with the CD release on Bridge Records scheduled for October 1. Colleagues and friends have contributed short piano works in Steve's honor for this project, including Donald Crockett's Nella Luce. Bargemusic, NYC, Thursday September 27. The stellar faculty of the Bennington Chamber Music Conference will perform Donald Crockett's Night Scenes for piano trio at the Saturday night faculty concert. Greenwall Auditorium, Bennington College, 8pm. Donald Crockett returns as Senior Composer in Residence with the Bennington Chamber Music Conference on the Bennington College campus, coaching participant musicians, working with Resident Composers Lei Liang, Pierre Jalbert and Paul Moravec, mentoring Composition Fellows, and working with the CMC faculty artists on new and recent chamber music, including Crockett's piano trio, Night Scenes. Donald Crockett returns to conduct the Aspen Contemporary Ensemble at the Aspen Music Festival for the opening three weeks. ACE will play in the weekly Chamber Music concerts in Harris Hall, and offer events at the Chapel Series and elsewhere in Aspen in Summer 2018. Additional details soon. Donald Crockett's chamber concerto for viola, to airy thinness beat, will be presented in a version for viola and piano (Kate Vincent and Brendan White) at the William Primrose Viola Competition and concert on June 15 at 5:30 pm in Mayman Hall at the Colburn School of Music. Other works on the program include Andrew Norman's Gran Turismo in a new version for eight violas, and music by Paul Chihara. Donald Crockett has been commissioned by the Kaleidoscope Chamber Orchestra for a new work for HOCKET: 4 hands in and around a piano etc. etc. plus a conductorless chamber orchestra of nineteen musicians. HOCKET is Sarah Gibson and Thomas Kotcheff, composer-pianists, collaborating with Kaleidoscope from the Steinway. The concerto, And the River, is a co-commission with Kaleidoscope, Aspen Music Festival and Oberlin Sinfonietta; stay tuned for additional details. The premiere will be with HOCKET and the Kaleidoscope Chamber Orchestra, Saturday May 12, 2018 at 10pm, Los Angeles Theatre Center; Sunday May 13 at 2pm, First Presbyterian Church of Santa Monica. Donald Crockett conducts Thornton Edge in the West Coast premiere of Stephen Hartke's new piano concerto, Ship of State, with soloist Xak Bjerken. This is a consortium commission with Thornton Edge and the Oberlin Sinfonietta, conducted by Tim Weiss. Also featured on the program is Donald Crockett's chamber concerto for viola and six instruments, to airy thinness beat, with violist Kate Vincent. Newman Recital Hall, USC campus, 7:30 pm. Donald Crockett leads the USC Thornton Edge new music ensemble in the world premiere of a violin concerto by Patrick O'Malley, with soloist Clara Kim, together with Veronika Krausas' analemma for 11 musicians and Jacob Druckman's classic Come Round. Newman Recital Hall, USC campus, 7:30pm. Donald Crockett conducts the latest edition of New Music for Orchestra with the Thornton Symphony. NMO and Crockett have premiered over 150 USC Thornton student orchestral works in this annual series. Bovard Auditorium, USC campus, 7:30pm. Fifth House Ensemble plays Night Scenes at the Grand Teton Festival in Jackson Hole, Wyoming, on February 2. Continuing its tour of Donald Crockett's piano trio, Night Scenes, Fifth House Ensemble performs the work at the Eastman School of Music on January 27. Donald Crockett leads Thornton Edge in a concert of toe-tapping music for ensembles large and small, including music by Dan Visconti, Don Freund, Sean Friar and Sarah Gibson. Newman Recital Hall, USC campus, 7:30 pm. Fifth House Ensemble plays Donald Crockett's Night Scenes at Roosevelt University in Chicago. The third of this brief tour by Gloria Cheng of Garlands for Steven Stucky, including Nella Luce, before Gloria goes into the recording studio for this project, which will also include works by Steve himself. An extended tour will follow the release of the recording; stay tuned. Gloria Cheng plays Garlands for Steven Stucky, Cooperage Project, Honesdale, PA, November 12th at 5pm. Gloria Cheng plays Nella Luce in the Garlands for Steven Stucky concert at the Tenri Cultural Institute in New York City, November 11th at 8pm. Pianist Gloria Cheng has asked thirty-two composers to offer Garlands for Steve for a recording and concert tour in honor of our late friend, composer Steven Stucky. My offering, Nella Luce, is named after Steve's beautiful string quartet, Nell'ombra, nella luce (In Shadow, in Light), and has kernals embedded from two Stucky new music classics, Boston Fancies and The Stars and the Roses. Gloria Cheng in Recital: Garlands for Steven Stucky, Brown University, Granoff Center, Martinos Auditorium November 10 at 8pm. Phillip Bush plays Pilgrimage at the Georgia Music Teachers Association 2017 Conference, where he is a Conference Artist this year. Berry College in Rome, Georgia on November 3rd. Pianist Phillip Bush plays Pilgrimage again this season in a faculty recital at the University of South Carolina School of Music. Friday October 27th at 7:30pm. Chicago's Fifth House Ensemble is carrying Donald Crockett's piano trio, Night Scenes, again this season. This performance is at the Driehaus Museum, Chicago. Donald Crockett leads USC's new music ensemble, Thornton Edge, in a program devoted to vocal music from the early third millennium. Featured are Of Being Is A Bird by Augusta Read Thomas, Only the Words Themselves Mean What They Say by Kate Soper, Death Speaks by David Lang, Those Quiet Evenings by Albert Behar, and carpet of flowers/for the first time today by Tamzin Elliott. Newman Recital Hall, USC campus, 7:30 pm. Pianist Gloria Cheng will perform a set of tributes to Steven Stucky written by a host of composers close to him, including Donald Crockett's Nella Luce; Gloria and pianist Xak Bjerken will also perform works by the late composer, and dear friend, in this invitation-only event to raise funds for the Steven Stucky New Music Residency Campaign, hosted by the Cornell University Department of Music. October 1 at 5pm in the home studio of Nancy and Mike Mooslin. Donald Crockett returns for his sixteenth season as Senior Composer in Residence with the Bennington Chamber Music Conference at Bennington College, Vermont, where he will work with Resident Composers Marc Mellits, Harold Meltzer and Susan Botti, Composition Fellows, CMC participants and performance faculty. He will also present a seminar, 'Composing String Quartets,' on Thursday August 10. Visit cmceast.org for details of the 2017 conference. Donald Crockett returns to the Atlantic Music Festival, where he will be teaching AMF composition students and coaching AMF fellows in performances of his music. The Caramoor Center for Music and the Arts has commissioned Donald Crockett for a new string quartet, String Quartet No. 4 'Traveling Symphony,' on behalf of the Argus Quartet, Caramoor's 2016-17 Ernst Stiefel String Quartet-in-Residence. The new quartet will be premiered at Caramoor's 2017 Summer Season on the evening of July 14. Joel Sachs leads the New Juilliard Ensemble in the New York premiere of Donald Crockett's Dance Concerto for Clarinet/Bass Clarinet and Eight Instruments at the Museum of Modern Art's Summergarden series, July 9 at 8pm in the Sculpture Garden. Donald Crockett returns to the Aspen Music Festival and School in Summer 2017 to lead the Aspen Contemporary Ensemble (ACE) for the first three weeks of the festival in concerts and reading sessions. ACE performs on the weekly Chamber Music concerts in Harris Hall at 4pm. 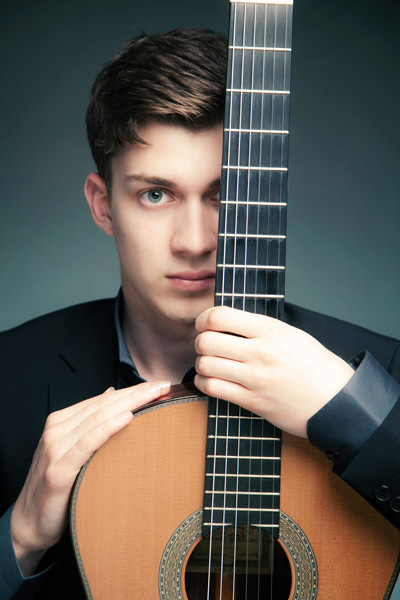 This season, Guitar Foundation of America 2015 International Competition first prize winner Thibaut Garcia is performing Donald Crockett's Fanfare Studies - commissioned as the set piece for the competition held in Oklahoma City in June 2015 - on a 60-concert international tour. Thibaut Garcia's performance of Fanfare Studies at the competition finals was, in a word, phenomenal. Over forty concerts are already in the books with venues in Louisville, Cincinnati, Oberlin, St. Louis, Phoenix, New York and Paris, among others. Upcoming concerts include March 25 in Brownsville, Texas, March 28 in Monterrey, Mexico, April 2 in Albany, New York, April 6 in Edmonton, Canada, and April 8 in Calgary. Donald Crockett's piano trio, Night Scenes, will be featured in the touring repertory of Chicago's outstanding new music group, Fifth House Ensemble, during its 2016-17 concert season. Donald Crockett leads Thornton Edge in music by Malcolm J. Singer (Bush Boogie), and Joan Tower (Noon Dance). Also on the program is music by Jennifer Higdon and James Matheson. Newman Recital Hall, USC campus, 7:30 pm. Donald Crockett's guitar concerto, En La Tierra, receives its New York premiere at Alice Tully Hall by the Riverside Symphony and guitarist Robert Belinic, conducted by music director George Rothman. Alice Tully Hall at Lincoln Center, 8pm. Visiting Sarah Gibson's home state, HOCKET (Sarah Gibson and Thomas Kotcheff) gives another prestidigitatious performance of Capriccio II, a duo piano concerto in all but name written for and dedicated to HOCKET, University of Georgia, Athens, GA, March 16 at 7:30pm in Ramsey Hall. Capriccio II is again in the sure hands of HOCKET in a featured concert at Webster University in St. Louis. March 9 at 8pm. Jeffrey Holmes' Hagall for large ensemble, commissioned by New York's Talea Ensemble, will be featured with Thornton Edge, Donald Crockett conducting. Also on the program is music by Stephen Hartke, Barbara White and Magnus Lindberg. Newman Recital Hall, USC campus, 7:30 pm. Continuing the premiere performance run of Donald Crockett's Capriccio II, the duo composer/pianists Sarah Gibson and Thomas Kotcheff, aka HOCKET, perform this work which was written for them on a concert at UCLA on February 24, hall and time TBD. Pianist Hui Wu will play Donald Crockett's Pilgrimage in a varied solo program at Brand Library in Glendale, January 28 at 2pm. Also on the program are works by Bach, Chopin, Stravinsky and Philip Glass. Donald Crockett conducts Hans Abrahamsen's hour-long, intricate set of canons for nine players, Schnee, on a Jacaranda series concert on November 19 at 8pm, First Presbyterian Church, Santa Monica. Donald Crockett leads USC's Thornton Edge in a program featuring Julian Anderson's 'Van Gogh Blue.' Newman Recital Hall, USC campus, 7:30 pm. The wonderful Dilijan Chamber Music Series, presented by the Lark Musical Society, has commissioned Donald Crockett for a new string quartet to be premiered in the 2016/17 season on a concert including music by Haydn (Emperor Quartet) and Beethoven (Archduke Trio). The world premiere of String Quartet No. 3 Cortege will take place on the Dilijan subscription series concert at 3pm on Sunday, October 16 in Zipper Hall of the Colburn School in downtown Los Angeles. Donald Crockett conducts the USC Thornton Symphony in the annual New Music for Orchestra program premiering outstanding Thornton composition students' works. The program includes music by Peter Shin, Ryan McWilliams, Georgi Dimitrov, Bryan Curt Kostors, Thomas Mellan and Julia Adolphe. Also featured are the cello quintet out of the Thornton School, Sakura, in Thomas Mellan's ...on transcendence..., and New York Philharmonic principal violist and Thornton alumna, Cynthia Phelps, in a preview performance of Julia Adolphe's Unearth, Release, commissioned by the New York Philharmonic. Donald Crockett conducts his USC new music ensemble, Thornton Edge, in classic works by Joan Tower (Breakfast Rhythms I and II), and Harrison Birtwistle (Carmen Arcadiae Mechanicae Perpetuum), together with recent music by Timo Andres and Thornton faculty composer, Sean Friar. Newman Recital Hall, USC campus, 7:30 pm. As part of the Los Angeles Philharmonic's new music marathon, Noon to Midnight, on October 1 at Disney Hall, Donald Crockett will lead a Jacaranda ensemble in Steve Reich's Eight Lines. Walt Disney Concert Hall, 5:30 pm. The piano duo Hocket, Sarah Gibson and Thomas Kotcheff, will premiere Donald Crockett's Capriccio II for two pianos, written for Hocket in celebration of the launch of the duo. The concert also features Stephen Hartke's Sonata for Piano Four Hands. Newman Recital Hall, USC campus, 7:30 pm. The Bennington Chamber Music Conference faculty will perform Donald Crockett's piano quartet, The Ceiling of Heaven, on July 30 at 8 pm in Greenwall Auditorium on the Bennington College campus as part of the Faculty Concert Series. Donald Crockett returns for his fifteenth summer as Senior Composer in Residence at the Bennington Chamber Music Conference at Bennington College, Vermont, for three weeks, July 24 - August 14. In addition to working with Resident Composers Jesse Jones, Sean Friar and Amy Williams, he will work with the composition fellows, coach conference participants, and work with the performance faculty. On July 30 at 8:00 pm, the CMC faculty will perform Donald Crockett's piano quartet, 'The Ceiling of Heaven,' in Greenwall Auditorium on the Bennington College campus as part of the Faculty Concert Series. 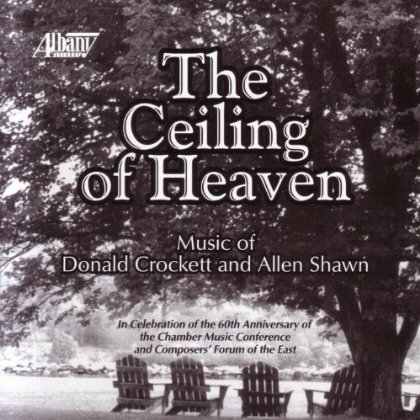 'The Ceiling of Heaven' was the first Jacob Glick Memorial Commission (2004) from the Bennington Chamber Music Conference. Other Glick commissions to date are by Gabriela Lena Frank, Paul Moravec and John Fitz Rogers. Donald Crockett's new music ensemble work 'Whistling in the Dark' will be performed at the Tanglewood Festival of Contemporary Music Fromm Concert on July 23 at 2:30 pm in Ozawa Hall. Donald Crockett will be a resident composer on the faculty at the Atlantic Music Festival July 17 - 24 at Colby College in Maine. In addition to working with the composition students at the festival, he will give talks about his music, master classes, and hear performances of his works by AMF students. Donald Crockett will be in residence at the Aspen Music Festival this summer, June 27 - July 16, working with the Aspen Contemporary Ensemble (ACE) and the composition students. He will conduct ACE in three Saturday concerts at the Festival. Donald Crockett serves as a judge for the 2016 JoAnn Falletta International Guitar Competition in Buffalo, New York. 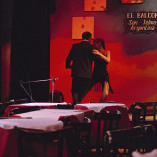 The finals, with orchestra, take place on Saturday, June 11. Conductor Timothy Weiss leads the Oberlin Sinfonietta in a performance of Donald Crockett's Tracking Inland for flute, clarinet/bass clarinet, harp and string quartet. The performance is at the Oberlin College/Conservatory of Music on the evening of May 5. Pianist Phillip Bush takes the Pilgrimage program to New York City on April 18, playing in Benzaquen Hall at the DiMenna Center for Classical Music at 7:30 pm. The program includes Sweelinck's Fantasia in D, Chopin's F minor Fantasy, Dutilleux's 1948 Sonata, and Pilgrimage. Pianist Phillip Bush will play Donald Crockett's virtuosic solo piano work, Pilgrimage, in a concert in Barnes Hall at Cornell University on April 17 at 2:00 pm. The program also includes music by Sweelinck, Chopin and Dutilleux. In the final concert of the 2015/16 season, Donald Crockett conducts Thornton Edge in a program featuring music from composers, including dear friends, who have recently left us. The program includes David Stock's Quick Opener, Pierre Boulez's Notations, and Steven Stucky's The Stars and The Roses. Also on the program is music by George Crumb and Sofia Gubiadulina. The concert is in Newman Recital Hall on the USC campus on April 13 at 7:30 pm. In a concert about Art and Activism, Thornton Edge and wildUp collaborate on a concert of politically engaged music conducted by the directors of the two ensembles, Donald Crockett and Christopher Rountree. The concert is in Newman Recital Hall on the USC campus on March 2 at 7:30 pm. Donald Crockett conducts Ades and Barry at Jacaranda concerts. Donald Crockett conducts works by Thomas Ades and Gerald Barry on the Jacaranda concert series in Santa Monica on January 30. Donald Crockett's Wet Ink for violin and piano will be performed by Houston's new music ensemble, Musiqa, at the MATCH Theater in Houston on January 9. 'Daglarym/My Mountains' performed and recorded by C4 in New York City. The New York-based vocal ensemble, C4, will reprise Donald Crockett's Daglarym/My Mountains in two concerts in New York City on November 19 and 21. Following these concerts, the ensemble will record the piece for their second album. Donald Crockett leads USC Thornton Edge in a program featuring music by George Crumb, Kaija Saariaho, Mark Anthony Turnage, and a world premiere by Cengiz Eren. 7:30 pm in Newman Recital Hall on the USC campus. Donald Crockett will be at Oberlin College Conservatory of Music presenting his music at the Composition Studio Class, and give masterclasses and lessons to Conservatory composition students. Donald Crockett will be Guest Composer with the New Music Ensemble at Cleveland Institute of Music, and work with students in masterclasses and lessons, October 29 - November 2. The New Music Ensemble concert on Sunday, November 1 will feature three Crockett works, 'Whistling in the Dark,' 'to be sung on the water,' and 'to airy thinness beat.' The soloist in 'to airy thinness beat' will be CIM faculty violist, Kirsten Docter. Donald Crockett conducts the annual New Music for Orchestra concert with the USC Thornton Symphony on Friday, October 16, 7:30 pm in Bovard Auditorium on the USC campus. Over the years, Crockett has conducted over 125 world premieres of orchestral music by talented Thornton student composers. Many of the works have gone on to win awards, commissions and subscription performances around the nation. Donald Crockett conducts his outstanding student ensemble, Thornton Edge, on the USC campus Wednesday, October 7 in Newman Recital Hall. The program includes music by Kurt Rohde, Hannah Lash, Oliver Knussen, Steven Stucky, and a bit of early music - Stravinsky's Septet from 1953. Donald Crockett's Ceiling of Heaven will be performed by Charles Wetherbee and friends at the Academy, Boulder CO. Written for piano quartet, the title is inpired by a line from a Kenneth Rexroth poem - "...the hawks scream, playing together on the ceiling of heaven" - Signature of All Things. Ceiling of Heaven was Jointly commissioned by Bennington Chamber Music Conference, Los Angeles County Museum of Arts and Xtet. Donald Crockett's Whistling in the Dark for mixed chamber ensemble will be performed by the Oberlin New Music Ensemble, conducted by Timothy Weiss. The piece evokes a series of dystopian dance-like scenes at the end of the world. Whistling in the Dark was commissioned by the California Ear Unit in 1999 and has been performed throughout the US including at the Museum of Modern Art in NYC and at the Los Angeles County Museum of Art. 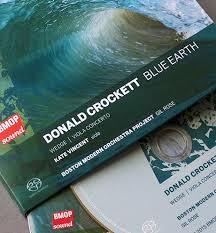 Donald Crockett's new orchestral CD, Blue Earth, was recently released by BMOP/sound. The recording opens with a virtuosic overture titled Wedge, inspired by the infamous wave break on the West Coast. Viola Concerto a highly colourful and evocative work, features soloist Kate Vincent with concertino (Firebird Ensemble) and orchestra. The title work of Blue Earth in an expansive sinfonia concertante for full orchestra. All performances by Gil Rose (conductor) and the Boston Modern Orchestra Project. Blue Earth is now available on Amazon and at bmop.org. Donald Crockett returns to the Bennington Chamber Music Conference in July and August, where he serves as Senior Composer-in-Residence, working with Resident Composers Kurt Rohde, Hannah Lash and Dan Visconti, Composition Fellows and the faculty and participants of the conference which is now in its 69th summer. Commissioned by the Guitar Foundation of America, Donald Crockett's 'Fanfare Studies' is the 2015 new work played by all contestants at the GFA International Competition held in Oklahoma City during June 22 - 26. The winner of the competition will play Fanfare Studies on tour internationally as part of the first prize award. In addition, Donald Crockett will conduct the Festival Orchestra in a concert of guitar concertos on Friday, June 26 at 8 pm. Donald Crockett's 'Night Scenes' for piano trio will be featured on a concert at the Smithsonian Museum of American Art with Lina Bahn, violin, Tobias Werner, cello, and Lura Johnson, piano. Donald Crockett's Roethke Preludes for orchestra will be performed by the Northwestern University Chamber Orchestra, Robert Hasty, conductor, on Saturday evening, May 2. Donald Crockett conducts Stravinsky's Septet with Xtet at the 50th Anniversary concert at the LA County Museum of Art, Bing Theater, April 29 at 7:30 pm. As part of the University of Wisconsin's George Crumb Festival, March 20-23, the UW Contemporary Chamber Ensemble will perform Donald Crockett's Whistling in the Dark on Saturday, March 21 at 8pm. Also on the program is music by George Crumb and Cindy Cox. Donald Crockett's duo for violin and viola, 'to be sung on the water,' will be featured in a Westside Connections concert of the Los Angeles Chamber Orchestra, curated by concertmaster Margaret Batjer. The performance will feature principal LACO players Sarah Thornblade, violin, and Roland Kato, viola. The concert is at 7:30pm at the Moss Theater at New Roads School. Visit laco.org for further information. Donald Crockett will be in residence at the University of Missouri-Kansas City during the week of March 9 - 13, conducting the UMKC Musica Nova in 'to airy thinness beat' with soloist, Meredith Treaster, and giving masterclasses and a composition forum on his music. Donald Crockett conducts Thornton Edge in music by Stephen Hartke, Lee Hyla and Judith Weir. Music for guitar and percussion by George Crumb rounds out the program. The concert is at 7:30 pm in Newman Recital Hall on the USC campus. Donald Crockett conducts USC Thornton Edge new music ensemble in a concert featuring music by Jonathan Harvey, Frederick Lesemann, Pierre Jalbert and Stephen Hartke in Newman Recital Hall on the USC campus. The concert is at 7:30 pm. Clarinetist Paul Cigan, who played the world premiere of Dance Concerto in the 8 instrument version with 21st Century Consort and conductor Christopher Kendall at the Smithsonian American Art Museum in April 2013, performs the piece with the University of Maryland Wind Ensemble, Michael Votta, conductor. A dramatic duet from The Face, an opera by Donald Crockett and David St. John, will be performed at the Provost's Distinguished Writers Series event featuring poet David St. John. The performers are Katherine Beck, soprano, Jonathan Mack, tenor, and guitarist Brian Head; David St. John will read this poem, among other works, and music by Frank Ticheli and Chris Sampson will also be featured. This USC Visions and Voices event is at 6:30 pm in Doheny Library on the USC campus. Pasadena Conservatory of Music faculty members Nic Gerpe, Yuri Inoo and Rebecca Merblum perform Donald Crockett's 'Scree' for cello, piano and percussion on a fundraising gala at the Conservatory on Sunday, February 15. The concert is at 4pm. Clarinetist Richard Faria joins the Ithaca College Wind Ensemble and conductor Steve Peterson in a performance of Donald Crockett's Dance Concerto at Ithaca College's Ford Hall at 8:15 pm. Kevin Geraldi leads a consortium premiere performance of Dance Concerto with the University of North Carolina, Greensboro Wind Ensemble, Anthony Taylor, clarinet soloist. Donald Crockett conducts the USC Thornton Symphony in the annual New Music for Orchestra concert featuring premieres of orchestral works by outstanding Thornton composition students. Under the direction of Donald Crockett, NMO has premiered over 125 orchestral works in the past quarter century, many of which have gone on to receive major performances and prizes nationwide. The concert is on Thursday, October 23 at 7:30 pm in Bovard Auditorium on the USC campus. Donald Crockett leads USC Thornton Edge in a repeat of the Carlsbad Festival concert on September 20. The concert is in USC's Newman Recital Hall at 7:30 pm on Wednesday, October 1. Donald Crockett conducts USC Thornton Edge at Matt McBane's Carlsbad Music Festival in a program including Sean Friar's 'In the Blue,' Andrew Norman's 'Farnsworth: Four Portraits of a House,' Ted Hearne's 'crispy gentlemen,' David Lang's 'Increase,' and his own 'Whistling in the Dark.' The concert is at 4pm at the festival's Main Stage, the Carlsbad Village Theater. Donald Crockett returns to the Bennington Chamber Music Conference as Senior Composer in Residence for summer 2014. He will supervise the Composers' Forum activities and work with Resident Composers Ted Hearne, Sean Shepherd and Laura Schwendinger, and the 2014 Composition Fellows. His work for oboe and string quartet, Celestial Mechanics, will be performed on the Faculty Artist Series on July 26. The Faculty Artist Series of the Bennington Chamber Music Conference will present Donald Crockett's 'Celestial Mechanics' for oboe and string quartet, featuring stellar faculty of the Conference. The concert is at 8pm in Bennington College's Greenwall Auditorium. The opening concert of MoMA's Summergarden concert series on July 6 features Donald Crockett's 'to airy thinness beat' in a performance by Joel Sachs and members of the New Juilliard Ensemble. Guitarist Brian Head offers a concert of new and recent music for guitar, including selections from Donald Crockett's set of preludes, 'The Falcon's Eye'. The concert is at 8pm at Monk Space, 4414 W 2nd Street, Los Angeles 90004. Boston Modern Orchestra Project, Gil Rose, conductor, presents Blue Earth for orchestra on a program with Steven Stucky's first Concerto for Orchestra. The concert is at 8pm. Visit bmop.org for more details. The Boston Modern Orchestra Project, Gil Rose, conductor, will record Blue Earth for an all-Crockett CD upcoming on BMOP Sound. Support for this project comes from the American Academy of Arts and Letters and the Aaron Copland Fund for Music. Donald Crockett will be in residence at the New England Conservatory Composition Department during the BMOP performance and recording of Blue Earth, presenting master classes and colloquia on his music. Donald Crockett conducts the USC Thornton Edge new music ensemble in works by Don Freund, Frederick Lesemann, Jordan Nelson, Jonathan Harvey and Donald Crockett. 7:30 pm, Newman Recital Hall on the USC campus. Thornton Edge new music ensemble presents Donald Crockett's The Cinnamon Peeler, featuring mezzo soprano Victoria Fox and conducted by the composer. 7:30 pm Newman Recital Hall, USC campus. Donald Crockett conducts the USC Thornton Symphony in its annual New Music for Orchestra concert featuring five new works by Thornton student composers. Donald Crockett has premiered over 125 new works leading NMO over the past 25 years. H. Robert Reynolds conducts the world premiere of Dance Concerto in this version for Clarinet/Bass Clarinet and Wind Ensemble. This will be the first premiere performance in a consortium of 22 wind ensembles around the country, with USC Thornton Wind Ensemble as the lead member of the consortium. Stefan Van Sant is the soloist. The concert is at 4pm. Donald Crockett will be in residence at the Liguria Study Center of the Bogliasco Foundation for a month of creative work as a Fellowship Advisory Committee resident. He was the Aaron Copland Fellow at Bogliasco in 2006 and is now on the fellowship advisory committee for the Bogliasco Foundation. Donald Crockett will present his Viola Concerto and opera, The Face, as guest speaker on Dan Asia's Composition Forum series at the University of Arizona. Donald Crockett will return to the Bennington Chamber Music Conference as Senior Composer-in-Residence, where he will work with Resident Composers Caroline Mallonee, Jeffrey Mumford and John Fitz Rogers, composition fellows, conference faculty and participants in the Composers' Forum activities. Donald Crockett will receive an Arts and Letters Award from the American Academy of Arts and Letters for exceptional artistic achievement as a composer. Firebird Ensemble performs Night Scenes in residence at UC Davis. The Panic Duo repeats Wet Ink in a concert of American music at the Pasadena Conservatory. The Panic Duo - Nic Gerpe, piano and Pasha Tseitlin, violin, perform Wet Ink on a concert of American music.